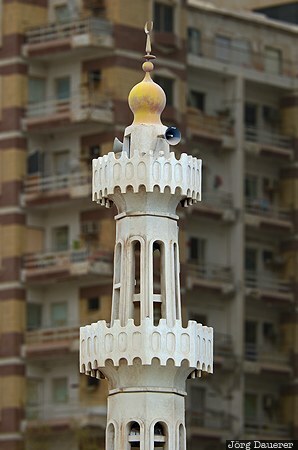 The minaret of a small mosque and the facade of an appartment building with balconies and windows in the background in the center of Abu Dhabi. Abu Dhabi is the capital of the Emirate of Abu Dhabi in the United Arab Emirates (UAE). This photo was taken in the morning in March of 2012. This photo was taken with a digital camera.